Welcome to 2/90 Sign Systems!Arc System Support | Welcome to 2/90 Sign Systems! Arc is a curved panel sign system consisting of a black metal frame with removable copy inserts secured by non-removable edge rails. Multi-inserts are separated by black accent strips that are available in other painted colors and satin natural aluminum finish. Tamper-resistant inserts are removable with a suction cup. Enjoy all of the standard insert materials including paint, wood laminate, faux aluminum and paper. Copy options include both ADA-compliant and non-ADA applications. Color: The standard frame color is black. Other painted colors available. Size: Horizontal Arc signs are available in standard widths of 4″, 8.5″, 11″, 14″ and 17″ with any height 2” to 92”. Vertical Arc signs can be of any width 2” to 92” with standard heights of 4″, 8.5″, 11″, 14″ and 17″. Custom sizes are available. Configuration: Arc sign is available with a horizontal or vertical arc direction. Application: The frame holds the structural backer which supports inserts and accent strips. Material: Painted PETG, faux-aluminum or wood-grain laminate, and paper with protective lens. Size: Inserts range in height from 1” to 24”. Configuration: Insert configurations with vertical cuts are not available for Arc signs with a horizontal arc. Insert configurations with horizontal cuts are not available for Arc signs with a vertical arc. Application: Inserts are removable with suction cup. Copy: Inserts are available blank and with copy. Copy applications include direct print, vinyl, laser print, subsurface, silkscreen, engraved, integral ADA, applied ADA and subsurface ADA. Material: Satin natural aluminum finish or painted color. Configuration: Edge rail placement is left/right of horizontal arcs and top/bottom of vertical arcs. Application: Edge rails capture the insert and are non-removable. Material: Standard material is black ABS plastic accent strips. Also available in satin natural faux-aluminum finish or painted color. Size: Each accent strip is 1/8” and adds to the overall height of horizontal Arc signs and to the overall width of vertical Arc signs. Application: Accent strips separate multiple inserts on Arc signs. For example, a 2x6B sign measures 2″ high by 6″ wide, with two-1″x6″ inserts. 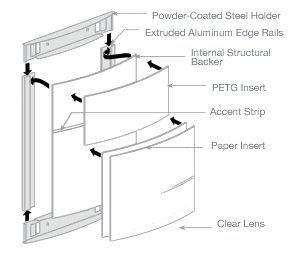 Arc signs with multiple inserts are separated by a 1/8″ high accent strip for a total height of 2 1/8″ high. Inserts are captured by edge rails approximately 1/2″ wide, for a total width of approximately 7″. Note: Insert configurations with horizontal cuts are not available for Arc signs with a vertical arc. Choose from painted or satin aluminum finishes. Choose Arc System copy inserts with a horizontal or vertical curve to accommodate your information. The tamper-resistant inserts can be removed with a suction cup. All signs have an internal structural backer to add extra support to copy inserts. engraved, integral ADA, applied ADA and subsurface ADA. Note: Edge rails capture the inserts. Therefore, inserts can only run the same direction as the arc. Laser print graphics are available on paper inserts and protected by a clear lens. Customer may order pre-printed paper inserts or print their own. Standard paper colors are available in popular insert sizes; other sizes may require longer lead times. Choose from over 16 mounting options for wall, cubical and ceiling installations. The Arc Modular Sign System includes 16 standard mounting options to meet a variety of installation applications for office furniture, vertical surfaces and ceilings. Connects to grid system using extruded aluminum 2″ brackets. Signs appear to be “floating” below ceiling line. Specify 1/2″ or 1″ grid system. Arc signs with multiple inserts have accent strips applied to the structural backer to separate the inserts. While the standard color of the accent strips is black, you can add contrast to your design by painting the accent strips another color or selecting satin natural faux-aluminum finish. Signs with dry erase material can benefit from choosing a Pen Holder to house the elusive dry erase marker. Pen holder is mill finished aluminum, painted black. Other colors are available.